The poor wittle blog, all by itself, so lonesome, waiting so long for new posts and comment love. So, I decide to return to it, and as soon as I begin adding tags for the first post, there is eye rolling and an exasperated sigh. The blog wants to protest the manner of my return, but fears another long silence, abandonment, or, deletion. Still, I hear the sullen mutterings. It wonders whether I deliberately chose the return post topic deliberately in an attempt to find out if we will truly hear crickets chirping in the silence after clicking the publish button. It wonders if I had considered less popular, more repelling topics such as religion, politics, crafting my own reusable LadyDays products, or an extreme frugality that eschews toilet paper. Ah, but this space has never been about popularity, so I carry on with the topic lying at my feet. What, not the topic at hand? No, that will have to wait for me to finish some mittens. I'm talking about weaving, and not just any weaving, but rugs. I decided to try out weft-faced (though I keep embarrassingly and erroneously typing warp-faced, even though I do know the difference) weaving. The purple and navy rug goes in the downstairs bathroom. The other one goes beside Bruce's side of the bed because he has wanted a rug there and he likes this one. I ended up with two rugs because I was both stupid and lucky. I was stupid to charge ahead with something new without carefully reading the directions. What was my mistake? I was supposed to thread every other slot/hole spot on the reed instead of every slot/hole across. I remedied that by clipping the extra warp ends and tossing them over the back. 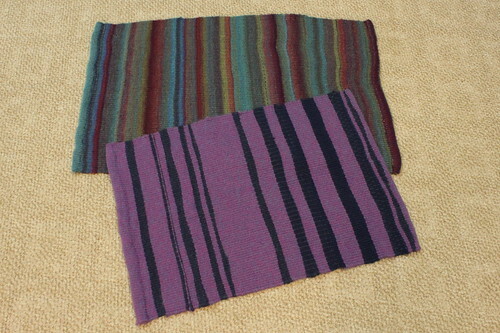 Then when I finished the first rug, I re-threaded the reed as well as I could, and wove the second rug. That I was able to weave two rugs is the lucky part. As far as the yarn deets, the purple yarn is Cascade Pastaza (discontinued yarn, and longtime stash resident) and I think the navy is Brown Sheep Lamb's Pride and Manos del Uruguay. That I was able to use up the Pastaza and some leftover random navy yarns is another way I was lucky. The other rug is Lion Brand Amazing in Glacier Bay. Perhaps we will talk more about that yarn later, but it may be one of those things that we will declare never happened. Anyway, now I just have to work up the nerve to put these rugs on the floor and use them. Actually, that does not bother me too much. I have made them to be used, I enjoyed making them, and if they need replacing, I will make more. I do have some yarn.